Dallas chiropractor Dr. Zinovy Chukhman is ready to help your body heal after you’ve been in a car accident. AlignRight Injury & Rehab in Richardson offers several treatment options for injured patients including chiropractic adjustment, physical therapy, spinal decompression and rehabilitation in our clinic. But Dr. Z and his staff would prefer you never need these treatments to recover from car wreck injuries. We’d rather help you avoid an accident in the first place! Therefore, with some help from Edmunds.com, Dr. Z offers the following driving safety tips. Most highway accidents happen in the fast, or far left, lane. Driving in the center or right lanes gives you more options for escape should there be a problem that requires you to quickly change lanes or pull off on to the shoulder. Don’t strictly focus on the car directly in front of yours. Scan the road several cars ahead, too. This way you’ll be more likely to spot a problem and still have time to react. You’re also less likely to rear-end the car ahead of you if they need to stop suddenly. Your side and rearview mirrors can only do so much to show you what’s happening around your car. Be sure to turn around and look into the lane next to yours before making a move. Also, be aware of other drivers’ blind spots and try to move out of them quickly. If the steering wheel is a clock face, then hold your hands at 9 and 3. This helps you control the car if you should need to maneuver quickly in order to avoid an accident. Move the seat forward or back so that when you reach for the wheel your wrists can rest on top while your arms are outstretched. In this position, your arms won’t fatigue as quickly and you’re positioned for evasive maneuvering. 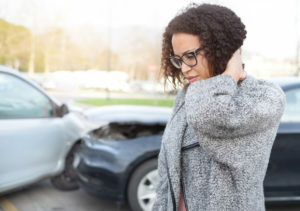 If there’s another car on the road with all-over body damage, then chances are the person behind the wheel is not a safe driver. Also, a car that drifts may indicate that the driver is tired, drunk, talking on the phone or texting. Get away! SUVs, minivans and sedans are not built like racecars—so don’t drive them as if they are. Know your car’s limits, including how fast you can stop at varying rates of speed. Follow your manufacturer’s recommended maintenance schedule. And be sure to change the tires when necessary. We know that sometimes you have to drive at night. But when you can, avoid late hour driving when you could be tired and your field of vision is reduced. After midnight is also particularly dangerous when bars and parties let out. If you haven’t take driver’s ed since you were a teen, then consider a refresher course. You’ll learn how to react in emergency situations. Even if you practice all of these steps, you may still be in an accident. If so, then Dr. Z is ready to help. Call AlignRight Injury & Rehab in Richardson to schedule an appointment.